Colonization increased on the island during the 16th century after the Portuguese Restoration War. Many of the buildings were built during this time period. The island became an important stop on the commercial trade routes to Africa and Asia exporting sugar and oranges. During the 18th century, Sao Miguel’s island flourished with new industries growing; tea, tobacco and pineapple became the leading exports. The island itself was formed from many faults and craters. These natural elements created 6 different volcanic zones that created the many mountains and peaks on Sao Miguel. 3 Calderas (crater lakes) are still active today. They are formed when an eruption occurs in a large volcanic crater causing the collapse of the mouth of the volcano. These 3 Calderas- Sete Cidades, Lagoa do Fogo, and Lagoa das Furnas are uniquely stunning in their own rights. After arriving on a short nonstop flight from Delta we grabbed out rental car and headed to our hotel, Pedras Do Mar located right on the Atlantic Ocean. The location of this hotel in the countryside was perfect. We were able to drive to various parts of the island easily! The views from our hotel room were fantastic. The hotel itself had a wonderful restaurant, spacious, modern interiors, and a gorgeous infinity pool that gave us the feeling that it was an extension of the ocean. What a fabulous place to relax- which we did at the end of every day! Renting a car is a must on this island because the driving is easy and there are so many places to see! Our first stop was at Cha Gorreanna, a Portuguese tea company. Gorreana is 1 of only 2 working tea plantations in all of Europe. First a bit of tea history on the Azores. In 1750, Sao Miguel sat right on the trade routes to Asia. Ships on this route introduced tea to the island. Cha Gorreana began producing black and green tea around 1883. It is believed that the Portuguese Royal Guards returning from a tour of duty in Brazil brought the first tea leaves to the island (for the purpose of growing the crop). Originally, the tea was grown for ornamental use. But a virus attacked Sao Miguel’s orange crop, Chinese experts were brought in to teach the correct techniques to produce tea. In time, tea became one of the most important crops to export from the island. When visiting the plantation, we decided to roam t the countless fields of green plants. We were able to wander through the various rows of plants which overlook the vast Atlantic Ocean. Getting up close to the plants provided us with the opportunity to really inspect them. Gorreana produces three different tea varieties. Each type of tea comes from various parts of the bush: Orange Pekoe from the bud or 1st shoot; Pekoe from the 2nd leaf; and, Broken Leaf from the remaining leaves. After walking the fields for a bit, we decided to head in to the factory. 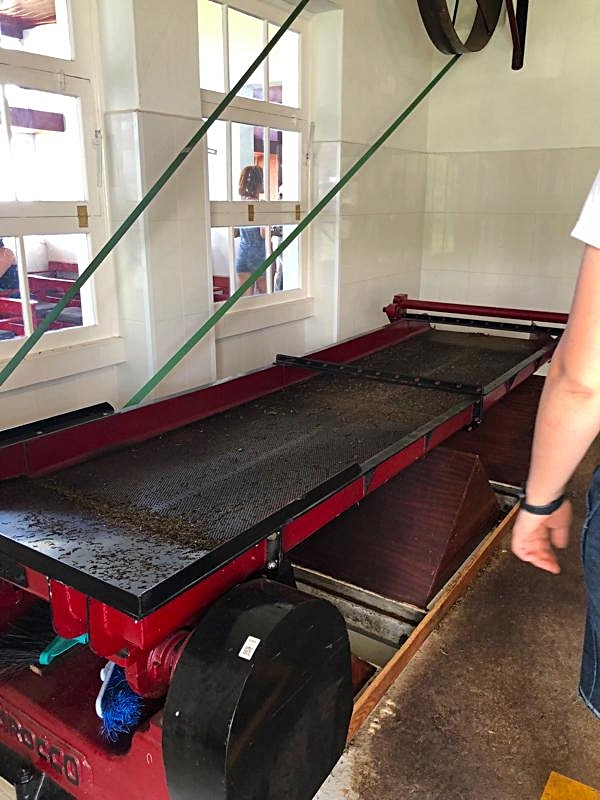 Different tea machinery (which are the machines that actual produce the tea) is set up like a museum. After a short video of the history of tea, we wandered through the various rooms housing the machinery which came from England in the 9th century. 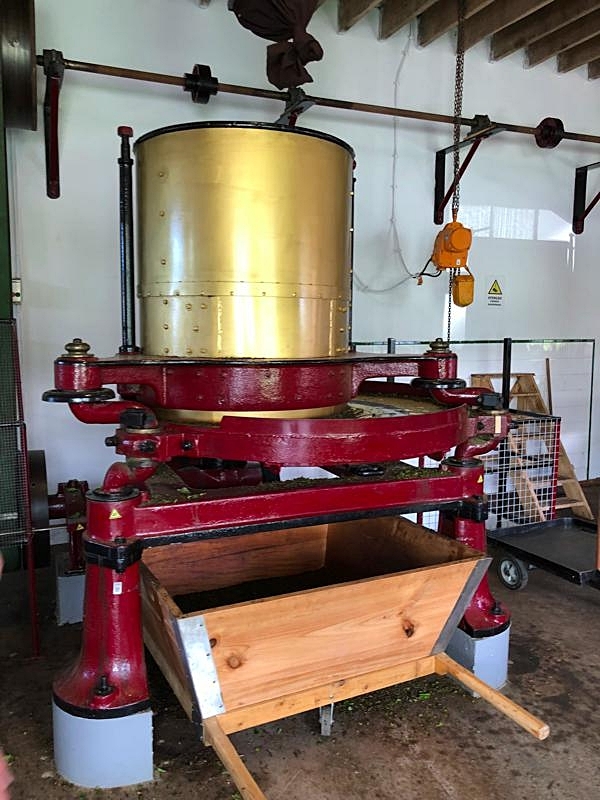 On any given day, a visitor can see the tea being produced! We loved the room where the leaves were all sorted. Tea is available to sample and purchase in a quaint stonewalled tea room. We enjoyed a nice cup of tea before venturing on a long drive along the northern part of the island- just exploring and enjoying the beautiful countryside. We decided that our next exploration would be inland! So, we drove to the small town of Furnas. Despite having one of the coolest sights to see on the island, this quaint village with narrow streets and whitewashed buildings was the least bit touristy. Nestled below beautiful mountains, Furnas was settled in the 1500s. 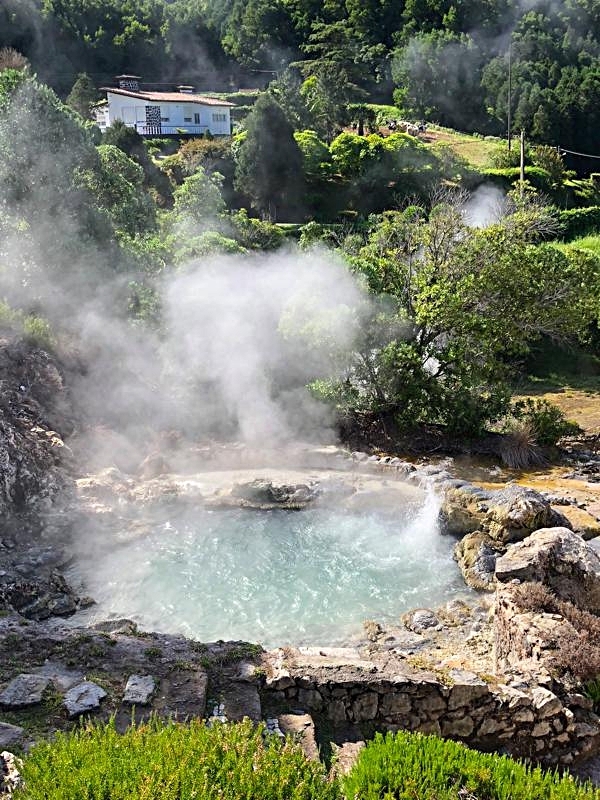 The village also features the most incredible volcanic geothermal springs and is located right next to the Furnas Caldera. 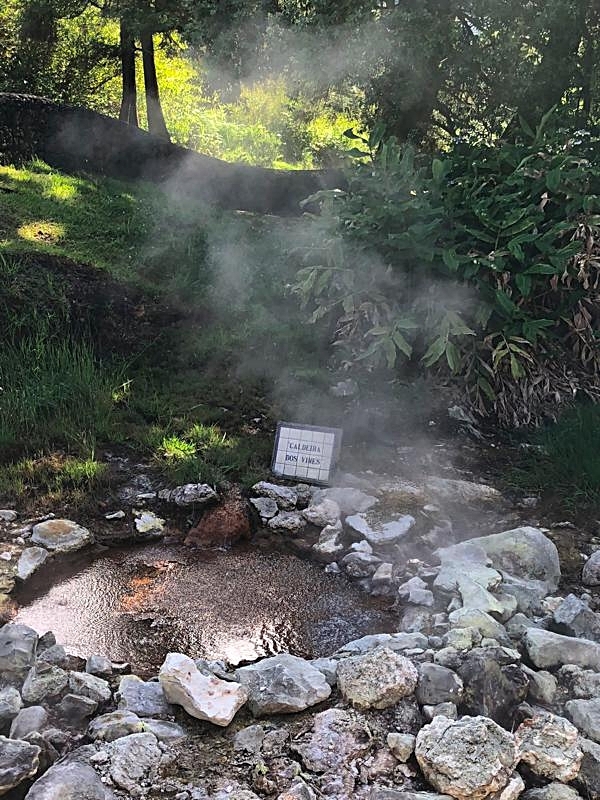 We began our visit in Furnas at the hot springs in town. It is truly an incredible sight to walk through this tiny place and see boiling water spurting from the ground with a bit of a sulphuric smell. Each small geyser was named. Wandering through this park of springs was super cool. After walking through the small springs in town, we headed out to the Lagoa das Furnas. This lake is one of the 2 large caldera lakes on the island. It is the main crater lake of Furnas Volcano which was formed over 100,000 years ago. The lake is very pretty; the 5 miles hiking loop hugs the edge of the lake. The main attraction, however, is the Caldeiras das Furnas. A series of boardwalks allowed us to walk around boiling springs, mud springs and even a mini geyser. We were so glad to have visited this area in the morning. The local restaurants of Furnas use this spot as a natural kitchen. As we walked on the boardwalk, we noticed large mounds of dirt which covered fumaroles (underground cooking holes). Local restaurants cook Cozida, a meat and vegetable Portuguese stew that cooks slowly for 6 hours in their own fumarole. Throughout the morning, chefs constantly check the stew in the ground. At noon, the pots are removed from the ground and brought to the restaurants. 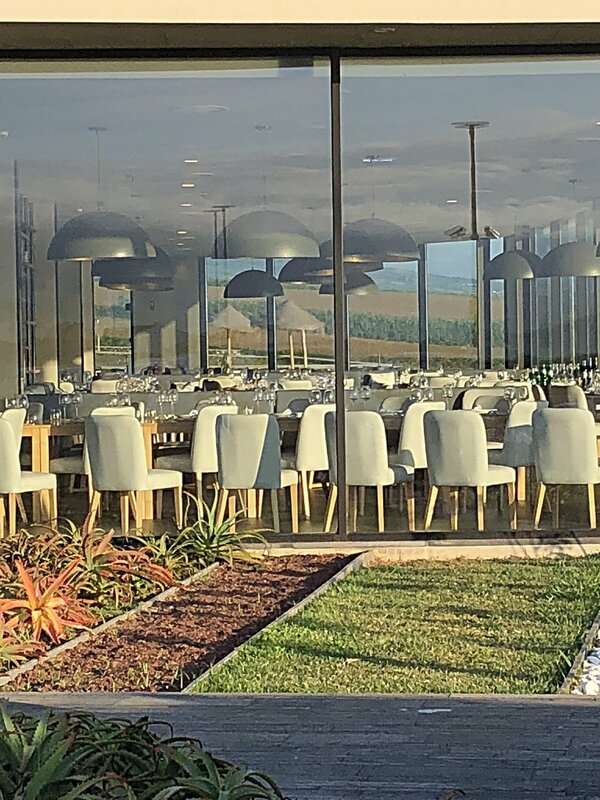 We ate our Cozida at Tony’s restaurant in Furnas; we weren’t prepared for the amount of food and the strong taste of the stew which was delicious! About 1 kilometer off the coast is the Islet of Vila Franca do Campo. My son and I were very eager to visit the Islet. It is only accessible by a small boat from the harbor. The boat looks tiny but we were shocked at how many people it held. The islet is a crater from an ancient submerged volcano. Today it is a very popular swimming hole with the clearest water you can imagine. In 1983, the islet with its endemic vegetation was classified as a Nature Preserve. It is only open from June to September. The islet was made famous in 2012 when the Red Bull Cliff Diving Championships were held there. 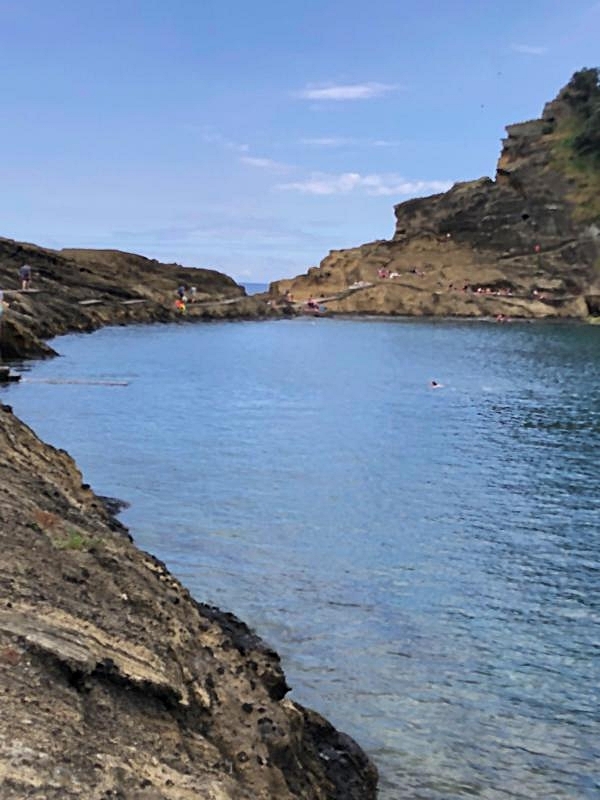 Arriving at the islet, we first noticed the “boquete,” a small, narrow channel that connects the swimming hole to the ocean. Despite waves being able to pass through this narrow channel, the swimming area is very calm. Disembarking from the boat, we followed a small path that hugged the side of the crater. We found a spot in the middle of the rocks that afforded us a view of both the swimming spot and the Atlantic Ocean. We spent a couple hours swimming and sunbathing before boarding the ferry back to the main island. After visiting, the first capital of Sao Miguel, we decide to visit the current capital Ponta Delgada. Ponta Delgada was settled as a small fishing village. 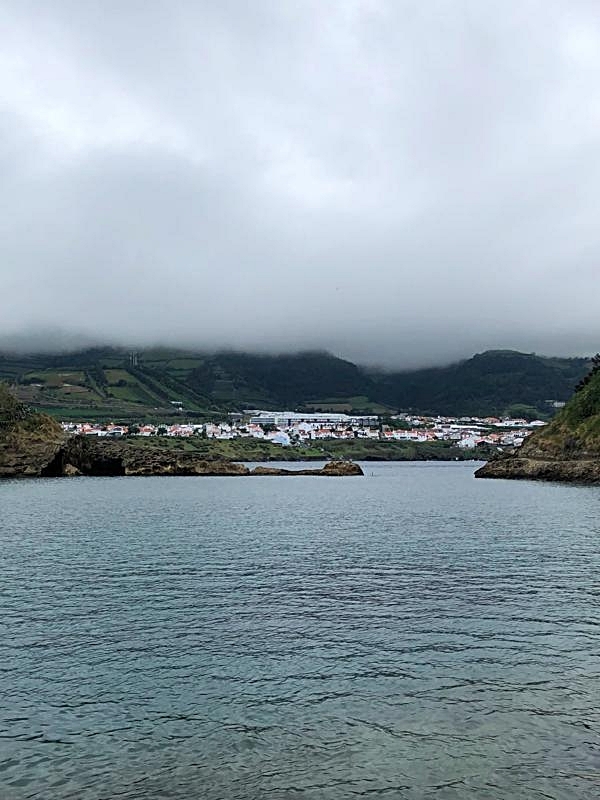 Since it was our first time to the Azores we decide to try a second hotel in town, The Azor located right on the water. This hotel had a very cool vibe with a rooftop pool and the Whale Watching bar with views of the harbor. It was a five-minute walk to the main sights. The city is filled with many small, charming public squares. The Portas da Cidade (or City Gates) welcome visitors into the city; this 18th century ornate gate features 3 arches. Its across from the Fort and the Church of San Sebastio. We started our tour of the city here! 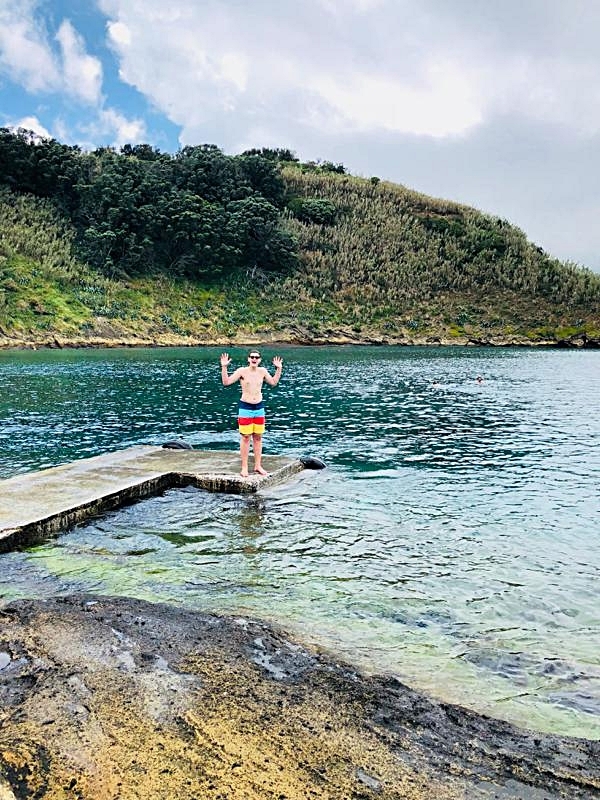 Sao Miguel is a wonderful island and excellent starting point for a trip to the Azores. There is much more to see in both Ponta Delgada and the rest of the island but these were our highlights. 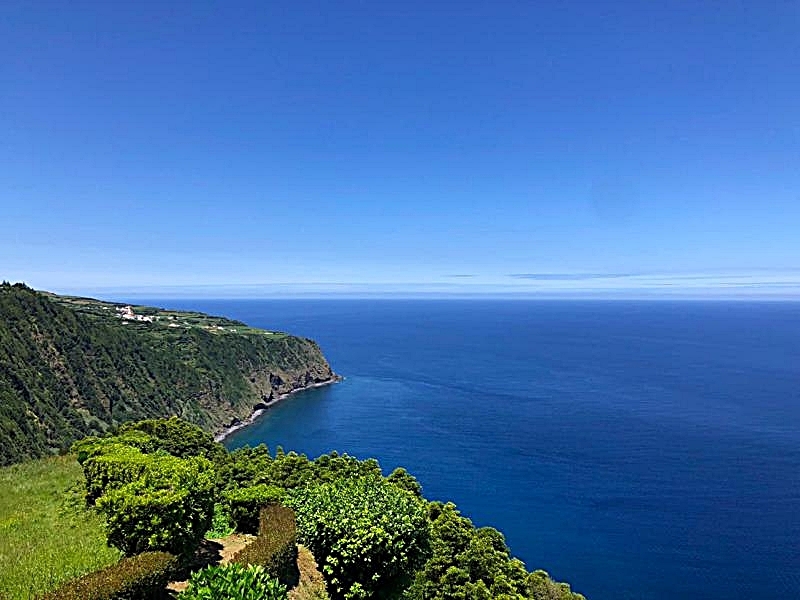 The friendly people, the delicious food, the beautiful natural landscape and wonderful Portuguese culture make Sao Miguel a must visit!